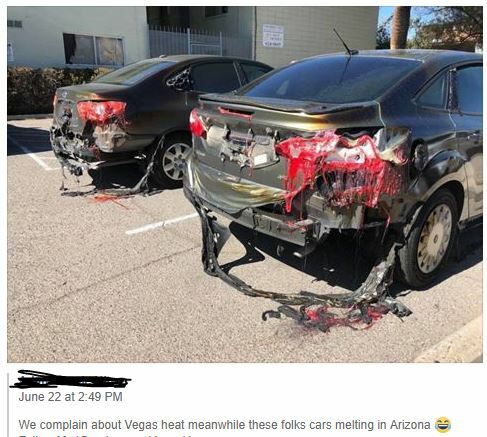 Facebook just posted to my timeline this picture claiming that cars in Arizona are melting in the heat. The weather is not melting cars. But there was a big fire in Tucson and the heat from the fire melted plastic parts on a bunch of cars in the parking lot. The pictures in this article fairly clearly match the cars, parking lot, and background building in the picture you attached. So, are cars in Arizona melting in the heat? A few that were unfortunately parked near a building that caught on fire. Did it have anything to do with the weather? No. A search on https://tineye.com led me to this tweet by @AyeElleJay with the caption "Slimmmmm! Arizona weather real different 😩" against that image. Replies to the tweet questioned its validity, and a user named @TheMutHouse replied "this is from a recent fire in tucson, the neighboring apartment buildings cars were melted." I'm not sure if it's the source of the image but a local news site does indeed have a story titled "Owners dealing with melted cars after construction fire". Do we have enough renewable energy for a humanity only using electrical cars?